Tabletop gas grills are your perfect mobile cooking companion not only because of their portability, but they are also great grills for their flexibility. Tabletop grills are great for use at picnics or tailgates, but are also ideal for those who have limited space available at home. You can pretty much enjoy a deliciously grilled meal anywhere. 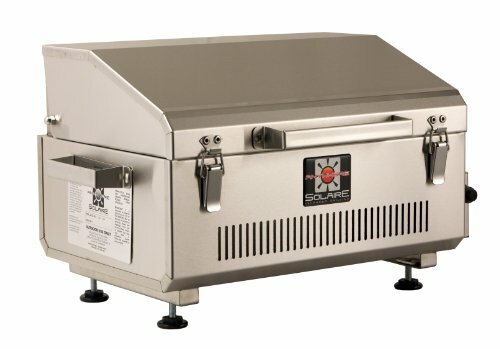 Even though some tabletop grills don’t have quite the same grilling power as the full-sized backyard grills, there are a group of tabletop gas grills that do have a decent amount of cooking area and power to grill up some of your favorites, and those are the grills we have meticulously researched and presented here for your perusal. You can refer to the interactive comparison chart below to take a look at the best featured tabletop gas grills that are consistently ranking highly among grillers. Aside from the high user ratings these gas grills received, they also are just plain well-equipped with great features to provide a seriously satisfying grilling experience. We are going to delve into the nitty gritty of a few of the grills that really deserve your attention for their capabilities and durability. The important grilling features we like to examine in greater depth are: heat energy and area ratio, quality of construction, price and the bells and whistles they offer that make them stand out from other comparably-priced tabletop gas grills. Two of the gas grills we’re highlighting below were also featured as two of our top picks for the best portable gas grills: the Solaire Anywhere Portable Gas Grill and the Magma Chefsmate Conniosseur Series Gas Grill, so we’ll be giving you just the quick and dirty run-down of their features and you can read our full feature for these two grills at Best Portable Gas Grills. We are also adding two other tabletop gas grills that are favorites for great performance, ranking them in our list of top picks for best of the tabletop category. 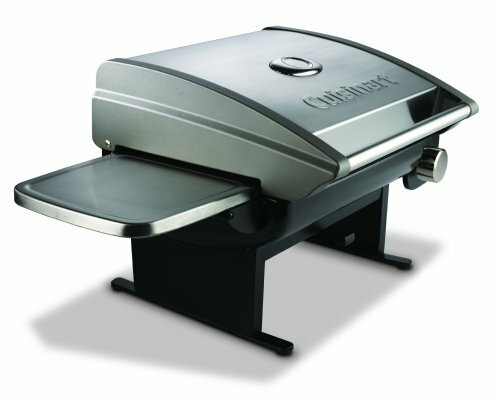 The Cuisinart CGG-200 is a modern-looking grill and a great option for all levels of grill-experience, as it is really easy to use and will satisfy the newbies as well as grilling veterans. It is incredibly versatile as it works well placed on a tabletop for picnicking or as a stand-alone with it’s own removable legs for easy tailgating. It is worth noting that if you do plan to use this guy with a stand, it could cost you a little more. Even though it only requires a little bit of space, the CGG-200 has enough cooking area at 240 square inches to feed an average-sized, but hungry! family. It is not ideal for large parties, as it can only hold around 8 patties at once, but a small gathering will definitely be satisfied by the meat output of this little guy. It also has a high enough heat output of 12,000 BTUs to sear your steaks and chops to perfection. Although it’s heat ratio does seem a little low for the size, it can still heat up very quickly, up to 500 degrees. It is worth noting that some users found that it could also be a challenge to keep the flame lit in areas of high winds. If you are planning to use this grill in a gusty outdoor area, make sure to position it so the flame is protected. The Cuisinart CGG-200 is also a favorite for it’s sturdy construction, with well-crafted burners made of stainless steel. The porcelain and enamel-coated stainless steel grates also have a flat, wide side for perfect grill marks, and can flip over for a smaller food contact surface for more delicate items, such as fish or large vegetables, a feature we love for the ultimate grilling versatility. 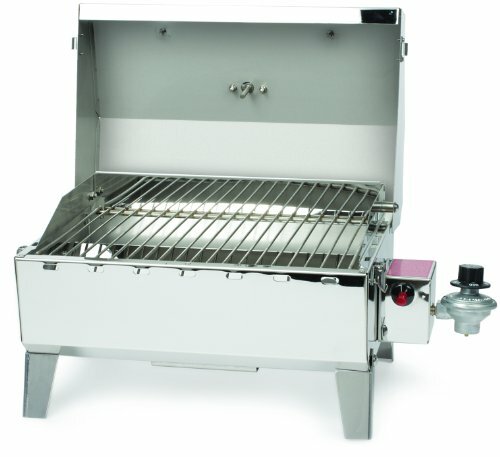 The Camco 58145 stainless steel gas grill features sturdy construction and excellent materials which prevent rusting and really extends the lifetime of the grill. It is also compact and very light at about 15 pounds, making it super easy to bring along on any adventure or outing. Below you can read up on more of our favorite features this little powerhouse offers. The Camco 58145 is very light and it’s folding legs add another level of convenience for grilling just about anywhere. It also has the ideal amount of heat of about 9,000 BTUs for its size of 125 square inches. The size of the Camco is a bit smaller than other tabletop gas grills we have reviewed, but we have found that you can still cook for about 3 or 4 people with ease. We also like that despite its small size, it heats up fast and high. Cleaning it also isn’t a problem as the steel exterior and interior components make for a fast clean up and the grease tray slides out easily. The Camco 58145 Stainless Steel Gas Grill is a great value for the money. This particular model comes with an easy-to-use, weather-resistant storage and transport bag, which is a great addition, considering you are purchasing the grill for the portability factor. The Camco also has a push-button ignition system for easy lighting and a regulator for the gas bottle built onto the side. You can enjoy all these great features for a list price of $159.99, but you can also check out the grill on Amazon as they usually offer a lower price, typically averaging around $125.47. This grill also received a 4.1 out of 5 star rating on Amazon, making this one of the best tabletop gas grills among consumers. You can read all about their reviews on Weber Q Gas Grills. •Regulator and valve may not work too long. •Gets too hot for slow cooking setting (425-450), incapable of temps below 425 degrees.